5.Chaka Khan Remixes & More! updates in the future since I am always adding rare music. me know if you need anything from the 9 lists. displays information from Billboard Magazine (1973 to the present). Please contact me with corrections or additional information. The 'Singles Chart' may be completed in the near future, so stay tuned! THE SUPER RARE 'Mama I Want To Sing' London Cast CD, The 'Patchwork-Chaka Khan LIVE 1987' Remastered & Expanded CD, Our Remastered & Expanded Edition of 'Live! 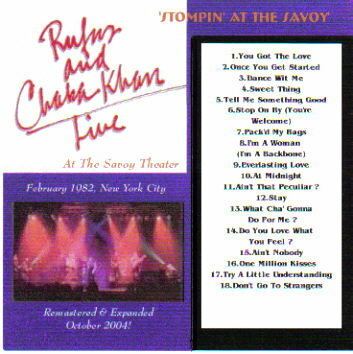 Stompin At The Savoy' now includes 'Everlasting Love', 6 Rufus featuring Chaka CDs have been remastered & are now exclusive 2-on-1 CDs (see list 1!! 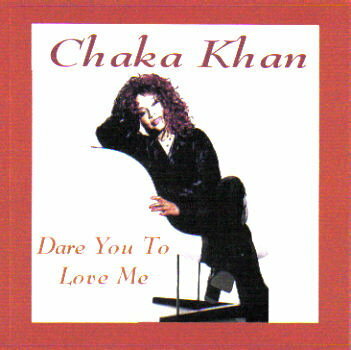 ), Our Remastered & Expanded Editions of 'Masterjam' & 'Camouflage' include B-Sides & More, The 'Chaka Khan Live @ The North Sea Jazz Festival'/'Divas Duets 2003' CD, the 'Chaka Khan Live @ The 2002 Pori Jazz Festival' CD, the 'Dare You To Love Me' CD was Remastered & Expanded in February 2004, Our Exclusive 'Chaka Khan - Motown Live & More EP' was Remastered & Expanded, and more coming SOON for SERIOUS CHAKAHOLICS ONLY!!! CD Cover Art & Reviews!! Rufus & Chaka Khan's Album/CD Chart Page!